A very common question asked when considering your rifle scope is, “what is the best scope magnification for the distance?” The best answer to that is both very simple and kind of tricky at the same time, as scope magnification can either enhance your target or throw you off. How does that work? Let’s find out. Magnification is a great tool, making your target larger and clearer so you can achieve the optimal shot. Generally speaking, “the least magnification that gives you a clear target image is the best scope magnification.”- gundigest.com. That’s basically the answer to our question, but there are some variables to consider. For example, will you be hunting or target shooting? Hunting will usually require a lower overall magnification setting based on your distance and the size of your target. Target shooting, on the other hand, can demand a higher magnification setting also based on range and support. Most large game hunting is done between 200 and 400 yards. Sometimes there are longer range hunts, but let’s focus on the 200 to 400 yard range for now. You definitely would want your scope magnified to clearly identify your target and the best shot, but you also would want to have the best lighting, least mirage presentation, and have that larger field of view to track your prey or see other better targets hanging around. The lower your magnification is set, the more quickly you can find your target in the scope and get off a shot. Most will agree that a fine setting for 300 yards would only need to be at 4x magnification, or 6x at about 400 yards. Many find that you don’t need any higher than 10x for a good 1000 yard range shot. You certainly would want the higher magnification for shooting at small targets, such as prairie dogs, where you need a magnified shot possibly from a longer distance. A good rule of thumb for picking your scope is lower than 10x if you’ll be targeting at 500 yards or less, higher than 10x if you are targeting more than 500 yards. Higher than 10x would be a good idea also to support your rifle. Related: Which scope focal plane is best for hunting? Target or competition shooting is where your higher magnification settings are most used. You can get those crazy high 16x or 32x or even higher scopes for absolute precision. The difference is that you don’t necessarily need a wider field of view. In this scenario the larger you can magnify your target to get the most accurate shot the better. These targets probably won’t be moving, so you don’t have to worry about trying to find a moving target through your optics. At such a high power setting, longer shots are much better suited for these scopes. At 16x + power, you would have much greater target resolution. However, there are some drawbacks if used for hunting. Magnification is worth very little in any application without corresponding resolution. Generally, this means higher quality optics, meaning very bluntly, more expensive, heavier and bulkier. Again, at anything over 16x power, you may have a difficult time if your weapon is unsupported and even minutely unstable. Higher magnification also equals less light capture, so in hunting scenarios where more light is desirable in failing light, higher magnification may hinder the amount of light that enters the optic. Focusing in that much also, as stated earlier, will drastically shrink your field of view, making it harder to quickly locate your target, or re-focus if the target moves away. This shrinkage in your field of view can be disastrous if somehow your scope has been knocked out of zero, and you are so magnified that you can’t even identify where your bullet is hitting. Another problem associated with higher power magnification is mirage distortion. This is where the heat from your barrel or ambient temperatures are also magnified, making your target distort and appear to move or be shadowed when it is not. As with other mirage effects, it can even double your image making it very hard to determine which is your actual target. Wind affects mirage also, making it a science to decipher the best shot when the winds keep changing on you. Fixed powered scopes are great. They are powerful and reliable. But what if you want to use the same rifle for different applications in the same day, requiring both short distance shooting and long range shooting? Think about military personnel. They need to be able to reliably and quickly adjust from long range to possibly very close distance targets, and it’s just not feasible to carry multiple scopes and take to time to change and zero them. This is where variable tactical scopes come in handy. The variable power settings of these scopes allow you to quickly adjust your scope magnification power to fit your need at the moment. They currently offer changeable settings in 4x, 5x and 6x. It is easy to see the benefits of having a scope offering such versatility. The disadvantages are that they usually do not have quite as sharp an image as a fixed powered scope, they are usually more expensive compared to the fixed power, and possibly more fragile due to the multiple lenses and coating layers needed for optical power variation. Related: You may also want to learn more about BDC reticles for shooting at different distances. With the locking turret, the CVLIFE rifle scope is a great choice for hunting and shooting. 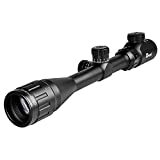 Completed with the fully coated optical glass, the scope would give you a bright and high-contrast image. Made of high-strength aluminum alloy and with its one-piece tube construction, the gun scope is definitely for greater strength and durability. Coming with the sunshade, you can use the tactical rifle scope in any light condition. Free 20mm rail mounts included makes the tactical scope can be installed conveniently and work perfectly. You should now have a fairly good idea of what you are looking for when setting your rifle scope magnification versus the distance. Just remember that your most beneficial magnification setting will be the one that still gives you the clearest, best image all the way around. Whether you go with short distance or long range, variable or fixed powered scope, just play with your settings while sighting in and you’ll find right where you need it to be. Do you hunt with a bolt action 308? You may be interested in our article on the best scope for 308.